There is little question that teams consider the medical part of the Scouting combine the most important. So it always makes sense to me that PFATS — the Professional Football Athletic Trainers Society — gives out awards to their members during this week. A few years ago, it was Jim “Machine” Shearer. Then there was an alumni award for longtime Cardinals athletic trainer John Omohundro. This week, Jeff Herndon (right in the picture below, along with head athletic trainer Tom Reed) received the same award as Machine had: The Tim Davey NFC assistant trainer of the year award (Shearer had actually won the NFC’s initial award in 2011.) Herndon has been with the Cardinals full-time since 1986, making 2017 his 32nd season with the club. As with all those guys downstairs who toil in virtual anonymity, Herndon isn’t going to crow about his honor, but he’s deserving — one of the best in the business. He has to be, really, to have lasted 32 seasons. Tonight, Machine says goodbye. It only makes sense to say goodbye to him. Machine is Jim Shearer, the long-time assistant athletic trainer for the Cardinals. And when I say long-time, I mean long — this is his 40th year with the franchise. But that’s coming to an end. Shearer is working the game for the Cardinals against the Seahawks. Friday, Shearer will be retired. I went to go ask Machine if I could get an interview, you know, just to write up a little story. I expected as much. The last thing Machine is ever looking for is attention. So I decided to get a couple quotes from someone who has spent a decade around Machine: Larry Fitzgerald. I asked Fitz if Machine ever gave him grief. Aside from his job, Machine was always really good with that. I can second that. (Oh how I wish I could relay my best Machine anecdote on that subject. Alas, I cannot.) Machine is the best, and not having him around is definitely going to change the vibe. Good luck in the next part of your life, Machine. Oh, the nickname Machine? It has to do with his expertise at taping players. The story behind Shearer’s nickname is right here. “Machine,” in fact, had a real name. 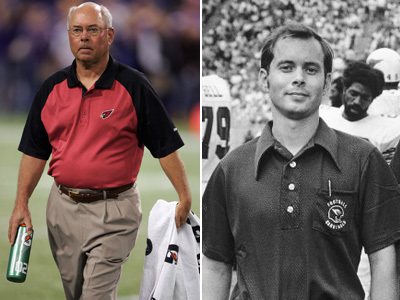 It was a while before I had learned it, though, since Cardinals assistant athletic trainer Jim Shearer never goes by anything but Machine, his nickname that might as well be his given name. He’s been around the Cards for a long, long time, with this past season his 37th on the team’s training staff. He’s a fixture, having been on the field for 745 games since 1974. He’s that guy who plays the crusty veteran, but beneath the thin facade is a good person (I remember him welcoming me to my job here when I transitioned from newspaper beat guy to in-house web reporter). As for the “official” story on how Machine became Machine (at least as told to me): Bowling on a team in St. Louis with Busch Stadium grounds crew personnel, Shearer was playing so well one night his teammates started saying he was a machine. Anytime they’d stop by the training room, they’d say things like, “Hey, it’s The Machine.” Players would hear, and as Shearer would start taping them quickly and effortlessly for practice or a game, a player would say, “He is a machine.” And the nickname stuck. The Pro Football Athletic Trainers Society, which holds meetings at the Scouting combine every year, decided to create an award to recognize an assistant trainer in both the AFC and NFC in the name of former NFL executive and long-time NFL trainer Tim Davey, who passed away unexpectedly in 2010. Machine was the first honoree for the NFC last week in Indianapolis. I wandered down to the locker room this morning to congratulate Machine and to needle him about not having a quote in the press release. He said media relations staff hadn’t asked. And even if they had asked, he said, he would have told them … well, let’s just say he would have declined.